Polls showed Juan Carlos Varela trailing in third place going into Sunday’s presidential vote, but the outgoing vice president shocked the country, and he will become Panama’s next president after leapfrogging both the candidate of the outgoing, term-limited president and the candidate of the Panamanian center-left. With 82.12% of the votes counted, Varela (pictured above), the candidate of the conservative Partido Panameñista (Panameñista Party), one of the country’s oldest parties, led with 39.00% of the vote. Trailing in second place was José Domingo Arias, the candidate of term-limited, outgoing president Ricardo Martinelli and the center-right Cambio Democrático (CD, Democratic Change), with 31.87%. In a surpassingly weak third place was environmentalist and former decade-long mayor of Panama City Juan Carlos Navarro, the candidate of the center-left Partido Revolucionario Democrático (PRD, Democratic Revolutionary Party), who was winning just 27.79% of the vote. Until the votes were actually counted, the race seemed like it was set become a photo finish between Arias and Navarro. 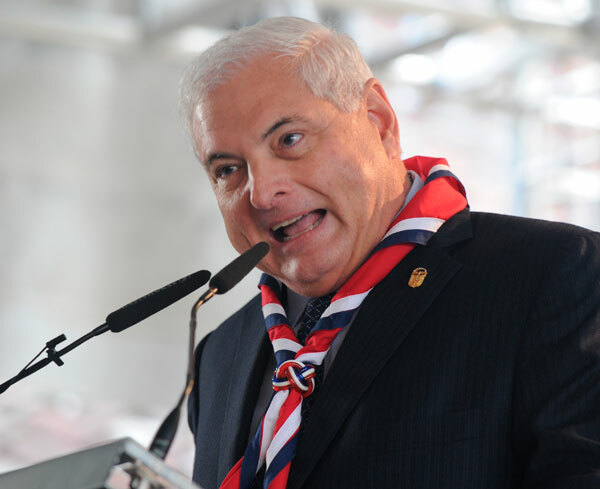 If he could run for reelection, it seems certain that Ricardo Martinelli, the grocery chain tycoon-turned-politician, would almost certainly win a second term in office — he’ll leave the Panamanian presidency this year with approval ratings in excess of 60%. But with Panama’s law prohibiting consecutive terms, the closest Martinelli can come to a second term is by supporting the ticket of his own center-right Cambio Democrático (CD, Democratic Change), whose vice-presidential candidate is Panama’s first lady, Marta Linares de Martinelli. Martinelli has a strong record. Panama’s economy has grown by an average of between 8% and 9% through his five-year term (significantly boosted by the revenues garnered from the country’s eponymous canal.). He’s also introduced supplementary pensions for Panamanians over 70, built Panama City’s metro system, and spent around $20 billion on infrastructure projects. That includes the $5.25 billion Panama Canal expansion initiated by his predecessor, though the expansion has faced cost overruns and worker strikes that have postponed the expected completion date from 2015 to 2016. He’s faced accusations, however, that he’s undermined Panamanian democracy, bullied opponents and presided over such a culture of corruption that Martinelli himself may face bribery charges in Italy after leaving office. 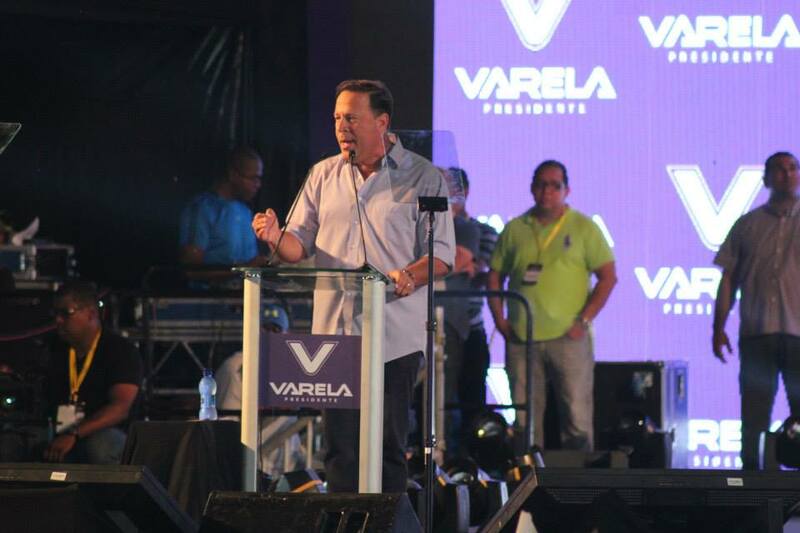 Critics argue that the CD’s presidential candidate, José Domingo Arias, another former businessman who served two years as minister for foreign trade and three years as minister for housing and land development under Martinelli, is merely a figurehead. 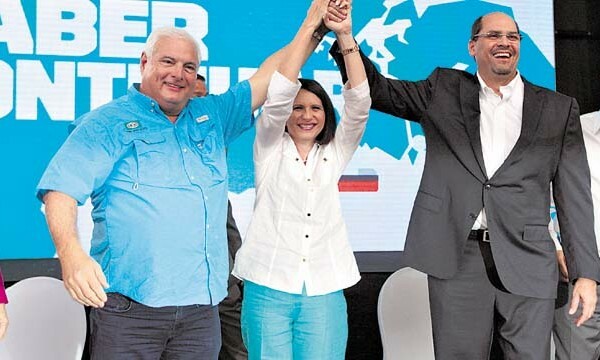 They worry that if Martinelli’s wife (pictured above with Martinelli and Arias) is vice president, the incumbent will continue to control too much power in Panama. Despite a constitutional provision that appears to limit family members of the incumbent from running for president or vice president, Martinelli’s allies on the Panamanian supreme court have not blocked Linares’s vice presidential candidacy. 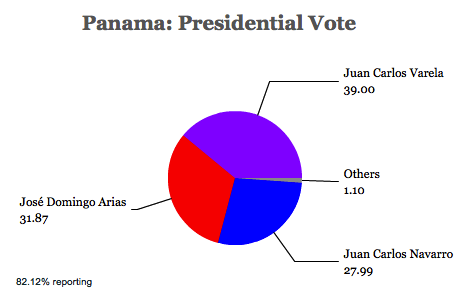 But there’s also a sense that most Panamanians realize this going into the weekend’s vote. In 2012, Mr. Martinelli tried to pack the Supreme Court by adding three new seats to guarantee his influence and raise the odds that he might overcome the prohibition on re-election the way Daniel Ortega did in Nicaragua. When Panamanians went to the streets to resist, he withdrew the proposal. The lust for power remains. It’s worth noting that even in Costa Rica, which has the best governance standards in all of Central America, two recent former presidents have been convicted of corruption. It’s also a pretty rich argument for a columnist in a country where the frontrunners for the 2016 presidential election are the wife of a former president (Hillary Clinton) and the son and brother of two former presidents (Jeb Bush). Martinelli himself took to Twitter to attack her in a fairly petty retort, which wasn’t perhaps the most convincing step. All pearl-clutching aside, and without getting into the theoretical question of ‘good corruption’ and ‘bad corruption,’ Martinelli certainly isn’t the first Latin American president on the right or the left to chafe at term limits. Though initially instituted to prevent the kind of personality-based caudillos that had a tendency to co-opt presidential systems throughout Latin America in the 19th and 20th centuries, strict one-term limits make presidents from Mexico to Chile lame ducks from the first day of their administrations. It’s not surprising that politicians like Martinelli (and like former Honduran president Manuel Zelaya) are looking for ways to escape the yoke of single term limits. 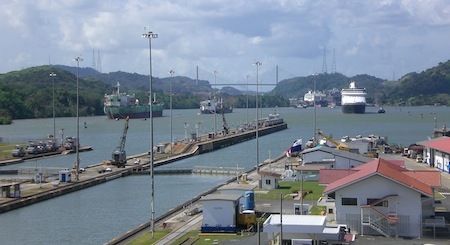 Joshua Keating at Foreign Policy‘s blog Passport today points to the global ramifications of the widening of the Panamá Canal — a third lane is set to open in 2014, and it will allow much wider ships to pass through the Canal than the “Panamax” vessels currently designed to pass the Canal. The new lane, which will allow for more efficient ships — economically and environmentally — is expected to affect global trade and energy flows in multiple ways, absolutely. It’s not quite as rosy as all that — the third lane’s opening date is now all but certain to be later — in 2015 (well after the date of the next Panamanian general election in May 2014). Although the Canal’s expansion is indisputably an economic boon to the small Central American country, it may not be such a boon for the fortunes of Panamá’s current president, supermarket magnate Ricardo Martinelli, who swept into office in a landslide 2009 promising to restore Panamá’s record GDP growth rates following the worldwide economic slump in 2008. Since the U.S. handed over sovereignty and control of the Canal to Panamá in 1999 (the result of a controversial agreement — at least in the U.S. — signed by Jimmy Carter in 1977), Panamá’s already solid postwar GDP growth skyrocketed. Starting in 2000, Panamá saw a rise in GDP growth that peaked at 12% growth in 2007 — it bottomed out at 3% in 2009 before bouncing back up to nearly 11% growth last year. Much of that growth is of course linked to the Canal and construction and service industries tied to it. 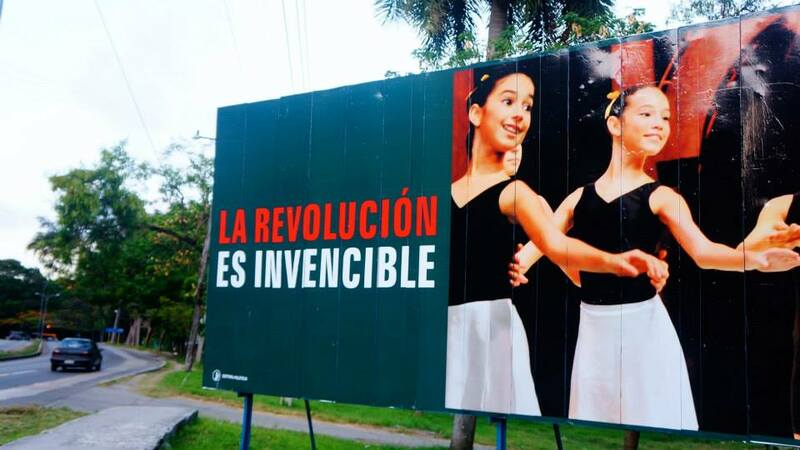 Each successive administration has taken advantage of Panamá’s increased wealth: Mireya Moscoso, who came to power in 1999 and presided over the transfer of the Canal to Panamá, used Panamá’s economic prospects to strengthen social programs, especially for children. Her successor, Martín Torrijos, initiated the Canal expansion project in 2006, and tried to lessen political corruption in Panamá. Martinelli has presided over the return to breakneck GDP growth, and he’s also enacted a fair share of legislative reforms, which have merited approving nods from global investors. As you might expect from a center-right businessman-president, Martinelli has enacted tax reforms to simplify tax collection, he has invested $20 billion into Panama’s infrastructure and he has championed the U.S.-Panamá free trade agreement, which was approved by the U.S. Congress and enacted into law by U.S. president Barack Obama in late 2011. But Martinelli has also enacted an increase in the minimum wage and instituted pensions for the elderly. Given his success so far, given the return of the Panamanian economy to double-digit growth rates, and given the lead up to the opening of the Canal’s third lane, you’d think that Martinelli would stand to gain most of the credit for that. Instead, however, it’s much more unclear — Martinelli’s party is far from certain to make gains in 2014.